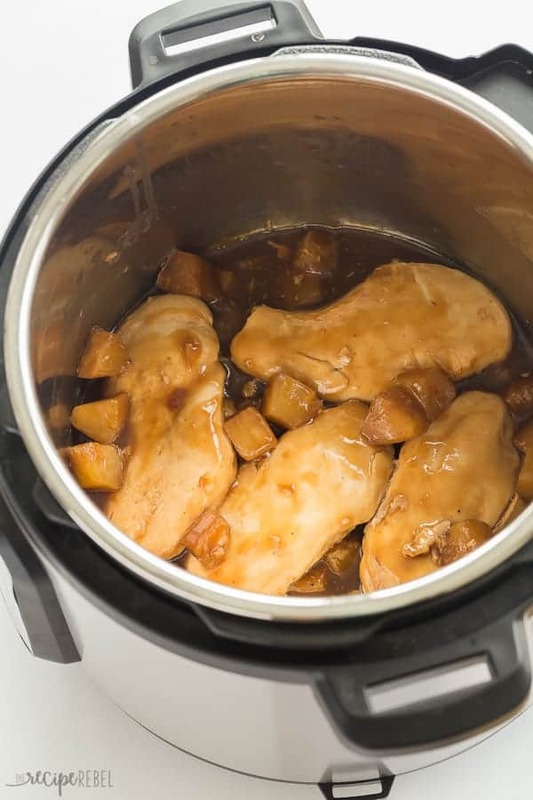 This Instant Pot Pineapple Chicken Breasts Recipe is an easy chicken dinner recipe that you can set and forget in your pressure cooker! Serve the chicken and sweet, tangy sauce over rice or noodles for the perfect weeknight dinner! Includes step by step recipe video. 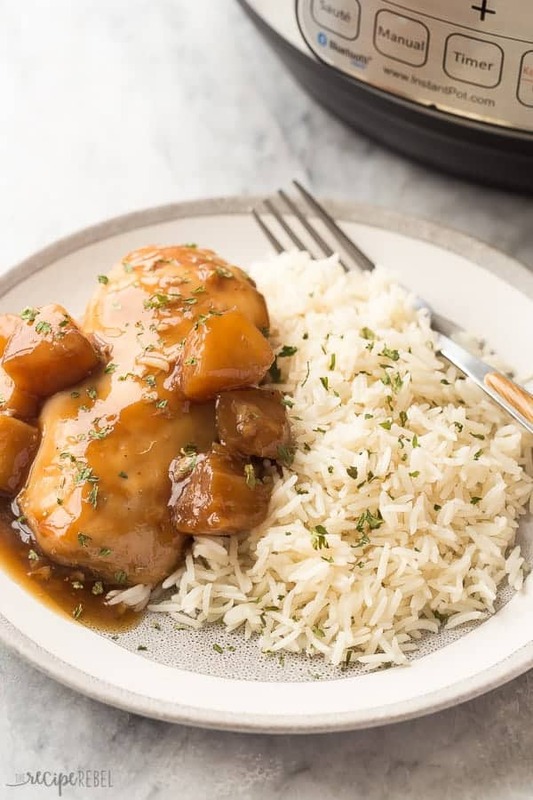 So now that we’ve explored some basic Instant Pot recipes, we’re taking things up a notch with these Instant Pot Pineapple Chicken Breasts. If you’ve been hanging around here for a while, you know that I will take pineapple on everything. Sweet or savory, breakfast, dinner or dessert — pass the pineapple. We are all about easy these days. Quick, one pot meals with few ingredients but big flavour is the way to go! 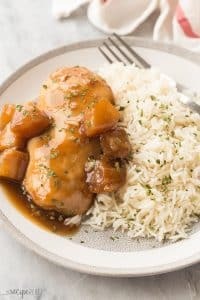 And this Pineapple Chicken is right on up there. I am not one of those Instant Pot lovers who have brought my microwave, my slow cooker, my oven, my skillets, etc., etc., etc., to the thrift store and now own just a collection of pressure cookers where they once stood. I still think it is best used for certain things, but chicken is one of those things. 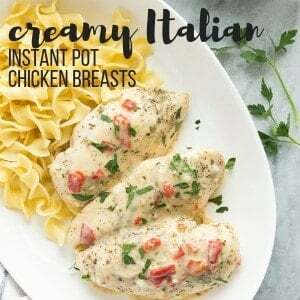 You can definitely make this recipe using frozen chicken breasts, but the frozen chicken will release more liquid and dilute the sauce somewhat, so you may need to punch up the flavour after cooking. Serve it over rice, pasta, or these Instant Pot Baked Potatoes (if you’re one of those people who owns more than one 😉 ), and you’ve got an easy, flavourful meal that the family will go crazy for! Make this recipe? Tag me on Instagram and let me see! My kids aren’t crazy about spicy food, but if you want to take things up a notch, you can sprinkle in a pinch (or more!) of red pepper flakes! I have found that at 10 minutes on high pressure, the chicken breast are easily over the safe 165 degrees F. If you have more than 4 chicken breasts and you are stacking them directly on top of one another, you may find you need to add a few minutes to the cook time. Always check the internal temperature of your chicken breasts before eating. 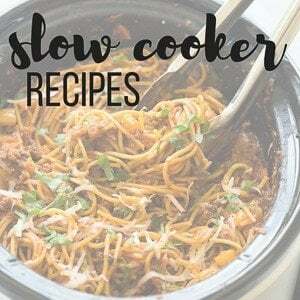 If you want to fill this meal out a bit more, feel free to add in some veggies: carrots, peppers and broccoli would be great, just keep in mind they will be very soft after 10 minutes so you may want to open the pressure cooker up part way and add them just for a few minutes. Add pineapple chunks with juice, soy sauce, sugar, salt and pepper to the Instant Pot (mine is a 6 quart). Stir until combined. Add chicken breasts on top of the pineapple. Put the lid on the Instant Pot and turn the valve to sealing. Set to Manual, high pressure, for 10 minutes. It will take about 10 minutes to come to pressure and start counting down. 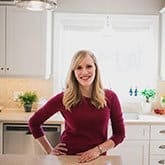 When the cook time is over, turn the Instant Pot off. Let pressure release naturally for 5-10 minutes and then open the valve to release any remaining pressure. Remove the lid and turn the Instant Pot to saute, and adjust to less heat. Stir together the corn starch and water and stir into the sauce (you can take the chicken out to do this but it's not necessary!). Cook and stir until the sauce has thickened, and then turn off. Serve chicken immediately over rice, noodles or with a side of veggies. This is wonderful and simple (I’m not much of a cook). Thanks for giving us this one, I will make it again and again. Oh, I did what you suggested with red pepper flakes and also added some roasted red peppers! Thanks Sue! I’m so glad it turned out well for you! If I doubled the amount of chicken to 6-8 breasts, do I also double the rest of the ingredients as well as the cook time? I would double the rest of the ingredients so that you have enough sauce! The cook time remains the same though. 3 minutes is sufficient for cooked chicken breasts for sure! I add a little extra time here because I found they are more tender. You can reduce the cook time if you want! Hi! This recipe looks amazing and I plan to make it tonight. Just wanted to check on the recipe instructions….do you release pressure when the timer begins at 10 mins (after the IP warms up), or do you allow it to warm up and then cook for the 10 min time before pressure release? Once the cook time is over, you’ll likely want to let the pressure release naturally for 10 minutes and then open the valve to release any remaining pressure. I hope that’s more clear! Do you need to sauté the chicken before?? It’s the best when there’s more sleep on the horizon! Loving this recipe and that it can be made in the IP! So excited to make this for my family! 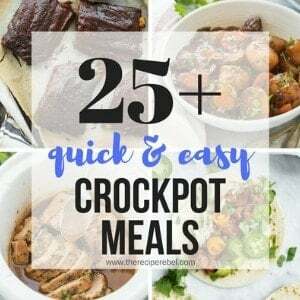 Instant Pot recipes for the win! Could you use a crock pot for this recipe? I haven’t bot an instant pot yet. Definitely! I would cook them on low for 3-4 hours probably, depending on the thickness of your chicken. I share your love of pineapple! I love that you used it here. And you used my love, the Instant Pot. I am really getting into using mine for so many things, it’s super handy. But I have not gotten rid of my other things yet…just not quite there. The flavors in this sound amazing, and I love the idea to sprinkle a dash of red pepper for some spice. YUM!